While I could take some time and reflect on all the buyout silliness, it’s time to talk about the mythics of the new set. Small-set mythics have a lot of potential, historically, but for almost all of these, the prices are going to go down. Picking out that one riser is tricky. Jace, Vryn’s Prodigy is the recent example that tells people ‘don’t miss out!’ but I remain content to sell them all immediately and lock in my value. One thing I want to point out: not only does this set get opened half as much as Shadows over Innistrad, it’s also going to be overshadowed by Conspiracy 2 in late August. I think that there’s a certain number of drafts that would have been EMN-EMN-SOI, but are instead triple Take the Crown, so the numbers in circulation are going to be lower. Not hugely lower, but lower nonetheless. My predictions are for what the card’s value will be when Kaladesh comes out at the end of September. Deploy the Gatewatch ($4) – It’s hard to argue with what this offers in the right deck. I’ll leave the probability analysis to others. What I think is that $4 is just right for this off the top, and it ends up being bulk. Foils are intriguing, though, and if they dip below $7 I’m going to go after them for a long-term hold. Gisela, the Broken Blade ($27) – This price is absolutely too high right now and she’s got a comparison in Archangel Avacyn that just makes her look bad. She’s a strong card, a mini-Baneslayer, but I think she settles in around $10 by the time Kaladesh rolls out. I also don’t see many decks that are going to run her instead of the Archangel, even as she costs less than her boss. Notably, though, this is a mythic Meld card. I think that the foils on this are going to see a serious multiplier as people chase their own shiny B.F.M. and I will be surprised if the foils go below $50 at any point. 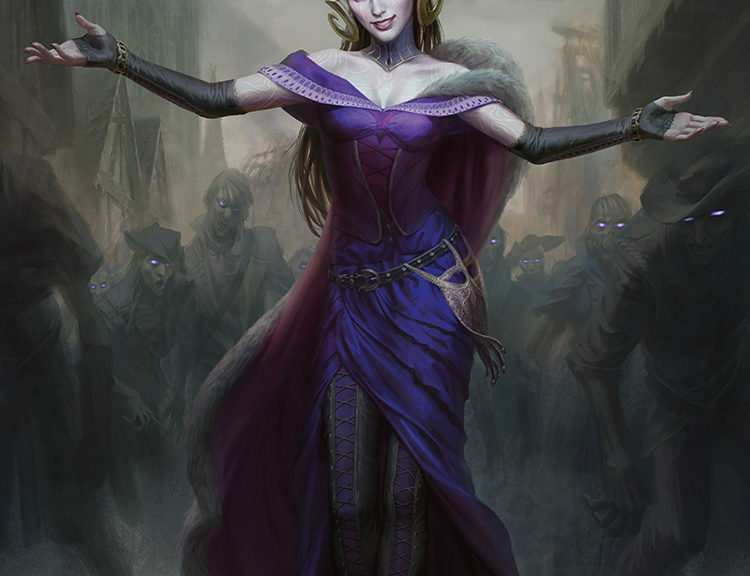 Liliana, the Last Hope ($23) – Now this…this is tempting. Three mana planeswalkers tend to be at least played, and there are some good things going on here. Her plus ability is better than the flipped Jace, Telepath Unbound’s plus. Yes, read it again. That’s until your next turn, not until end of turn as we are used to. Her minus gets you something you already want, or maybe an upgrade if you flip over a more appealing target. Her ultimate is good for, at the minimum, two Zombies per turn, and you’ll get the first two right away. Liliana is only pick to go up. I think she finds multiple homes and stays between $20 and $30, with real potential to jump very high right away. Tree of Perdition ($5) – Oh you lovely people that are going to jam this in Standard with Triskadekaphobia. I commend you. I value you, and I want to see photos all over Twitter of this happening. It’s janky as janky can be, and this card is going to be higher than bulk, but only just. Ishkanah, Grafwidow ($3) – I’m not sure who was clamoring for the Legendary Spider, but congratulations, those people! You’ve given us another bulk mythic. I don’t get why Spider Spawning and Nyx Weaver outrank the three spiders with red in their costs, but whatever. Mind’s Dilation ($3) – Seven mana. Does nothing the turn you play it. Wild variance in effect. Possible for your opponents to outmaneuver it by doing nothing or manipulating their library. All that adds up to a bulk mythic and Commander gold! I can’t wait to play it and get slaughtered for cackling evilly. Nahiri’s Wrath ($6) – This cannot hit players. I repeat, this cannot hit players. Therefore, at best, it’s a bad removal spell, costing you at least one more card than you’re killing. Potentially, this goes in decks that want to dump their hand, but you have to do so much here. Bulk mythic. Mirrorwing Dragon ($5) – This is a sneaky-great card. It’s got the ability to spread your good spells out to your whole team, and will spread your opponent’s kill spells to their whole team. It’s got potential, but I think $5 is where it stays. Emrakul, the Promised End ($20) – In a deck that can mill itself effectively, I can see this costing 9 or 8 mana, and that’s when this card is impressive as hell. She is indeed what we were promised, a fixed version that is a real beating. Who cares that they get to take a turn after you use a turn for them, because you cast spells badly, made crummy attacks, and messed with everything. I think Emrakul doesn’t drop far, maybe trailing down to $15, but the casual demand for her is never going to let the price fall too far. Foils are going to be crushing wallets all over, likely $60+ for the duration. Decimator of the Provinces ($8) – It’s no Craterhoof Behemoth. It’s going to have the same problem that Overwhelm did: you want all your creatures to be in play and attacking! The Emerge cost means that it’s got a green color identity for Commander, and as such, only some decks can play it. I think this ends up near-bulk, at $3 or so. Tamiyo, Field Researcher ($26) – Three-color planeswalkers have a rough history. Nicol Bolas, Planeswalker was powerful enough, and could be run alongside Cruel Ultimatum, but was never pricey. Sarkhan Unbroken is awesome, with very good abilities, and sees no play. Tamiyo defends herself well, but the plus ability requires creature combat. Right now, there’s a Bant Humans deck that is set up with the right manabase, but would it be worth it to jam a couple of these and make Collected Company that much worse? I’m doubtful, and I think she ends up at $10. Grim Flayer ($14) – I think this card is sweet, but it’s got the misfortune of being in the same Standard as Sylvan Advocate. There’s going to be a period where this is legal and the Advocate isn’t, but the Flayer is just so outclassed. This isn’t going to see heavy play, and I’ll be watching to see if this goes too low. My prediction is $5-$7. Gisa and Geralf ($6) – This is the type of card that is mythic only to save us from awful games of Limited. This is tough to beat in sealed or draft, with a constant flow of card advantage. Relentless Dead has seen a big spike lately, and I think this is why. G&G offer a lot of potential in casual decks as well, and you can’t overlook repeated abilities like this. Financially, though, I think this is never going to be too valuable, with regulars likely a dollar and foils pushing $10, because people love Zombies! Ulrich of the Krallenhorde ($6) – Angels and saints preserve us, we finally got the Werewolf legend that Commander players have been pining for since original Innistrad. Ulrich is underwhelming to me, though, and I’m not alone. You get a one-turn bonus to power and toughness on the front, and conditional removal on the back. I suppose there will be turn cycles where he flips back and forth, but I think Huntmaster of the Fells is neck and neck here. I expect that this is going to be very cheap, around $2, but the foils will be up to $10-$15 from those who are dying to jam every Werewolf into a hundred-card deck. So with Tamiyo, if the only issue is the 3-color cost, then why not run her with Oath of Nissa and call it a day? A deck with tons of card draw and enough control and/or card-drawing-chumps to get you to her ultimate. Any of the G/X/ Eldrazi shells would work just fine. You make some great points and who wouldn’t want to play a planeswalker with an ultimate that is basically ancestral recall and omniscience mashed into one. Both of you make interesting points, but I am going to wait and see on Tamiyo. Her casual appeal is sky-high thanks to her ultimate but I’m going to need to see consistent Standard results before I buy in. You don’t know who was asking for a black green legendary spider? Guess you don’t read Maro’s blog lol. Oath of NIssa and Sarkhan Unbroken are both Standard Legal…have you seen anyone run Sarkhan Unbroken??? I think Tamiyo sees some mild play, but you don’t build 4 color super friends walkers in competitive magic off the hopes that Oath of NIssa lets you cast all your walkers. New Tamiyo isn’t bad, she’s just 3 colors. Even limits her commander appeal. Financially I agree with Cliff, sell now, buy back in later unless she’s in your Bant CoCo/humans sideboard…I don’t event think there’s room main for her. We’ll see. @Ishkanah, Grafwidow, agree on the financial point of view, but I think many are underestimating this card. If Delirium is a thing this card is pretty powerful, on top I see synergies with Liliana and emerge costs.